Golden rays of sunshine began to seep in through the small gaps between the two curtains that were lazily closed last night. 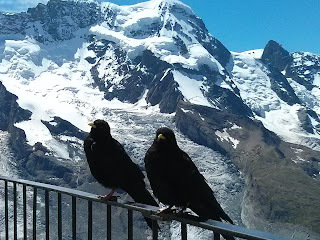 The husband rolled out of the bed and opened them up as we woke up to the mesmerising view with the lake below in the front and Jungfrau to the left. The summit was a bit cloudy but nevertheless it was a view worth waking up for. There were two small wooden chairs in the balcony and I made a suggestion that the rest of the morning and a good part of the afternoon should be spent soaking in the view starting with some coffee and may be ending it with a good glass of wine. The suggestion was promptly dismissed by the husband as he told me that we had to catch the 834 bus from Beatenberg (which was where our B&B was) else we would miss the good views of the Matterhorn. Now personally I have become very cynical of this hiking early morning to catch the best views. Just last year, husband and I were at Machu Picchu and we had woken up at 300 am to trek up and see the sunrise from the top and all we had got were thick clouds for most of the morning. Not only that, we had survived the rain and made it up the Wyna Picchu only to take photos against a full foggy backdrop. So anyway, dismissing my cynicism, I stepped out of the warm and cozy bed, my legs still tired from earlier day's long and tiring exploration of the Golden Pass trail. The husband turned on the tv to the cable channel that has live feeds from the camera on the mountains. The train tickets are pretty expensive so make sure you choose a clear day before you make the trek. Jungfrau was absolutely foggy that morning so we decided to do Matterhorn which was nice and sunny looking at the feeds. 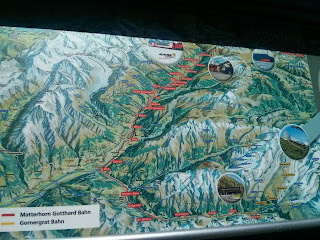 The journey from Interlaken to Gornergrat was long. Firstly we took a train from Interlaken Ost to Visp - this was about an hour in the regular SBB trains and since we had a six days Golden Pass card, we didnt have to buy a separate ticket. 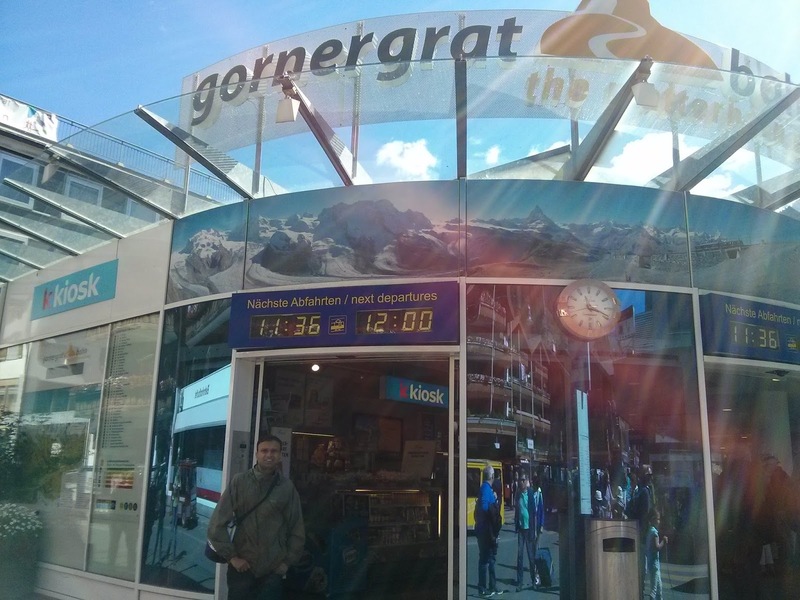 At Visp, we changed to the mountain railway - the Matterhorn Gotthard Bahn that takes you right up to Zermatt in about an hour and twenty minutes. 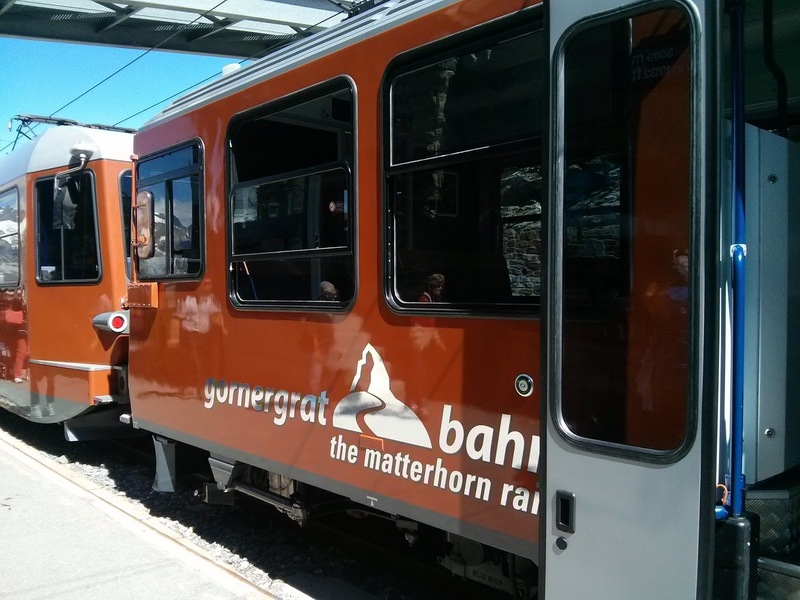 The trip on the Matterhorn Gotthard Bahn is absolutely stunning and is only a pre-cursor to what you are about to experience near the Matterhorn. As the train went towards Kalpetran, it went in and out of the tunnel until suddenly, in between the trees, we could see the tip of the Matterhorn. 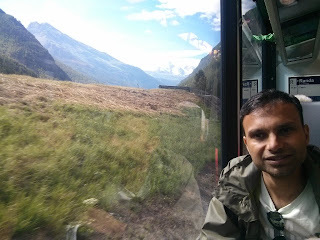 The tip of the Matterhorn was still covered with snow while the mountains surrounding the train were plush green. The sky was clear blue and the golden rays of the sun were making the Matterhorn shine even brighter. I took out my camera and clicked a few pictures from the train window. The train trudged slowly going criss-cross between the steep mountains which were almost vertical at times. We were sometimes greeted by the waterfalls and sometimes by the river dancing with its clear blue water besides the railway line. As we passed St. Niklaus & Herbriggen, Matterhorn was right in front of us. With every minute, it felt that we were getting closer and closer and the excitement was building up. Just then the ticket checker informed us that our golden pass ticket isn't valid from Visp to Zermatt. We were on the mountain railway Matterhorn Gotthard Bahn, so we bought our ticket on the train. I questioned the husband about the economics of buying the Golden Pass before settling back in my seat and soaking in the view outside. 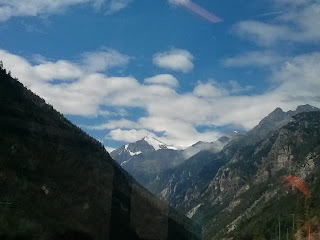 The ticket checker requested us to pay in cash because the card machine required internet connection which was very weak in this narrow valley between the mountains. Luckily we had cash for onward journey so we buy one way ticket for both of us. The train then picked up some speed while rushing through Randa and Tasch. 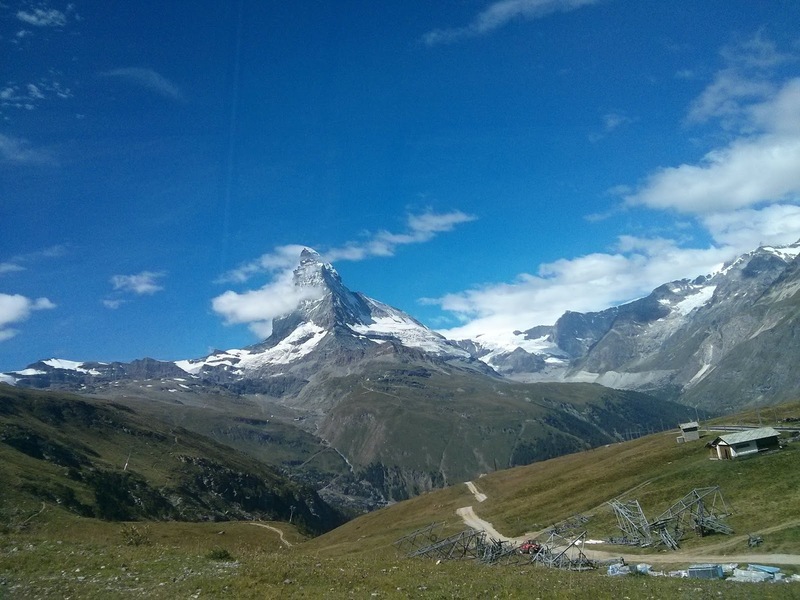 If you are coming by car, then you need to park your car at Tasch which is about 5 kms from Zermatt. Our train finally reached Zermatt which is a car free village at the height of 1650 with romantic neighbourhoods and quiet corners. All the houses around the village are loaded with flowers. There are no automobiles in Zermatt. Walking – going by foot – is our common form of transportation. There are alternatives: bicycle, eTaxi, eBus or horse-drawn carriage. 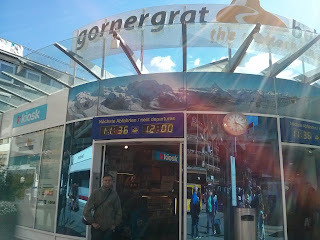 Upon arrival, we crossed the road to take the Gornergrat Bahn which was a very wise decision. The husband, as usual, needs to checkout the restroom area as is the usual regime while I queue up for the train. The train ticket is 90CHF return for one person and you can hop out and hop in on any intermediate stations if you want. As soon as the train arrives and the doors open, there is a flurry of people trying to get on the train to catch a window seat. It's quite close to getting on the train except you can't jump in while the train is moving making it a bit more civilised. If you do manage to get on early, try to sit in the right side in the direction of travel. By sheer luck, we do sit on the right side and we cannot stop marvelling as the Matterhorn begins to show. 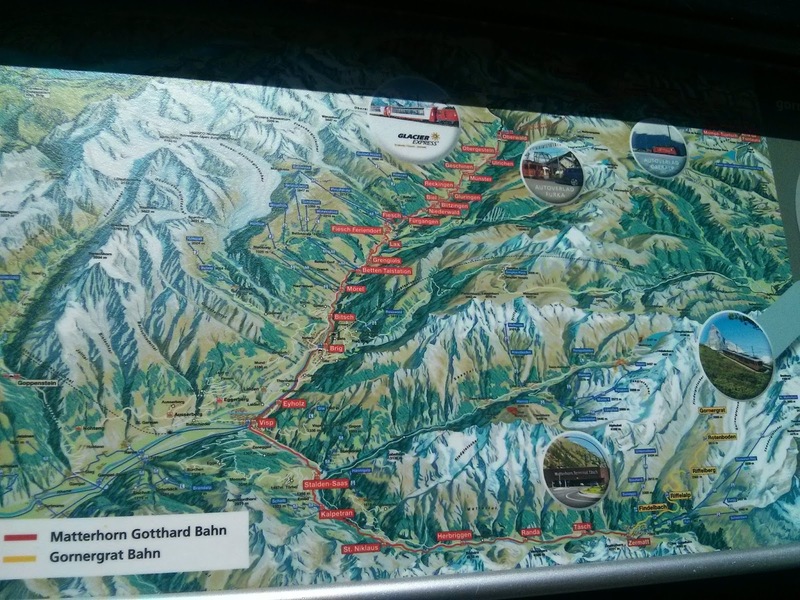 The train in itself is a wonderful experience and is Europe's highest cog wheel railway moving about 14km/hr, quite a descent speed for travelling at a gradient of 20. As we continue the journey, we pass the highest tree range in the alps. There are 4 stops on the way but I suggest that you go all the way up first and then hop off wherever you want while coming back. Words and photos cannot do justice for the beautiful views one gets going up in the train. The train comes to a halt at Gornergrat and you will not be disappointed by the mind blowing views of the tall standing Matterhorn. At the Gornergrat summit you have a fantastic panorama of seven glaciers beneath a 360-degree sweep of 29 peaks over 4000m including the Matterhorn and the Monte Rosa (Dufourspitze). Matterhorn is made up of two words - "Matter" and "Horn", the second word means "horn, peak" whereas the first means possession : literally, Matterhorn means "Zermatt's peak". Matterhorn is truly a swiss icon and the view from Gornergrat is impressive and worth all the time and money. It was a perfectly sunny day but a small cloud loitering around the 4478m peak was irritating me. I waited for it to clear and then it was heavenly. From every angle, its aspect varies and as the day passes, it changes playing with colours, hues, shades, sun and clouds. The near symetrical and majestic peak rises in the Alpine mountains and stands tall almost demanding a worship. The overall landscape from Gornergrat is so nice that it might even force you to forget the Matterhorn for a while. The scenery around you is hypnotising and you cannot get enough if it. At the top there is an hotel, an observatory, a small souvenir shopping mall and even a little chapel. We sat down and had our lunch amidst the glaciers. While coming down, we got down at Rotenboden and from there you can then walk towards Riffelsee lake. In the lake you can take a picture perfect postcard photo of the Matterhorn and its reflection in the Riffelsee lake. 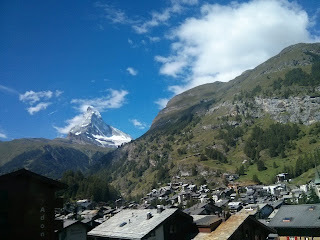 Once back in Zermatt, we went around the main street trying to soak in the charming village. Other thing to do in Zermatt is the Matterhorn Musuem. The alternative option to view Matterhorn by taking the Matterhorn Glacier Paradise to Klein Matterhorn but we skipped that. The day ended with a nice dinner of cheese fondue at Beatenberg with Jungfrau in background, where we go tomorrow.